On the coldest June evening in Melbourne in 25 years there’s a fog under the roof of Etihad Stadium for Richmond’s clash with Sydney. It’s first versus second, the first time in 84 years a meeting between the clubs has enjoyed this status. Back in Round 6 of the 1934 season Richmond travelled to the Lake Oval to meet South Melbourne. The teams had played off in the previous year’s Grand Final. This was won by the Swans’ famous ‘Foreign Legion’, so-called because wealthy club president Archie Crofts was able to recruit star players from around the country with the promise of employment in his retail empire in the midst of the Great Depression. 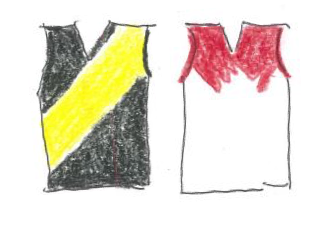 Back then it was the Swans on top and Richmond second, with both on four wins and one loss. Tigers captain-coach Percy Bentley urged his men to show the Southerners that they had won “a charity flag” in ’33. Richmond duly won by 44 points. They also rolled them at Punt Road later in the year by a goal before making it three in a row with a 39-point triumph for the premiership in September. Maybe there are ghosts here in the mist tonight, the spirits of hard men like Jack Dyer, Jack Titus, Bob Pratt and Laurie Nash who have come out to renew acquaintances and support the modern manifestations of the teams they represented all those years ago. Richmond is compelled under AFL contractual obligations to play this home fixture away from the MCG. Critics are suggesting that they can’t win when playing away from their stronghold at Yarra Park. The Tigers have won 16 games in a row at the home of football and are gunning for Melbourne’s record of 17 wins in succession in 1955-56. The Swans don’t mind Etihad Stadium, having prevailed in 14 of their previous 15 games there by an average of 48 points. They’ve won six in a row in the present season and were the last team to defeat Richmond at the MCG. That was when they overcame an early six-goal deficit to get home by nine points in 2017. The footy purists are salivating at the prospect of the latest installment in the rivalry between Rance and Franklin, the aptly entitled ‘Lance Rance Dance’. I arrive early with my son. We’re anticipating a big crowd, but it falls short of the 50,000 capacity. Perhaps it’s the Thursday night scheduling and the fact that some Richmond fans supporters are loath to travel to the Docklands. There’s a scattering of Swans fans amongst the ranks of the yellow and black in the stands. I observe one older lady wearing a crocheted red and white cap with matching poncho, no doubt her uniform of choice since the days of cheering on Bobby Skilton at the Lake Oval in the sixties. The game lives up to its billing. It’s an intense struggle where the combatants apply maximum pressure on each other. The Swans open proceedings with two quick goals to Ben Ronke. Halfway through the term Reece Conca, playing his hundredth game after eight years of struggling with injuries, is twisted in a tackle by Franklin and McCartin and is left on the turf clutching his ankle in agony. As the cart prepares to remove him from the field every Richmond player strides over to encourage their fallen mate. Conca raises one arm to acknowledge the applause of the Richmond supporters as he exits the arena. It’s an inspiring moment in what is otherwise a distressing incident. The quarter extends to 38 minutes after the enforced delay. The Tigers boot the last five goals of the stanza and lead by 18 points at the first change. One of them is scored by Daniel Rioli. The ball passes through the hands of Oliver Florent. Rioli is behind him and in a split-second manoeuvre he scoops up the ball on the half volley with one hand, bounces to his feet, steps inside an opponent and bananas it through the sticks. It lifts the Tigers. Sydney don’t like high-scoring shoot outs. They flood back into defence and urge the Tigers to try and find a way through their defensive grid, planning to regain possession as quickly as possible and catch them on the rebound. The game follows a pattern where the Tigers slowly increase their lead with the Swans making enough of their opportunities to stay in touch. Rance and Franklin are locked in an absorbing duel. Buddy is on target and finishes with four for the night, but fumbles under pressure at critical times. Alex launches a number of vital interceptions and has more of the ball than his opponent. But Riewoldt is the best forward on the ground. He is brilliant in the air. Jack goals at the at the 23-minute mark of the third quarter to put the Tigers up by 22 points. But they can’t quite shake the Swans. During the third quarter they score with the aid of three fifty-metre penalties. The last of them comes at the 30-minute mark when Franklin tumbles in a marking contest and receives the free kick. The replay on the scoreboard is met with howls of derision from the Richmond faithful. We reckon he blatantly staged for it and call for the AFL to fine him a year’s salary. He kicks into Rance on the mark and our outrage transforms into hysterical laughter. We are silenced when the umpire decides that Alex stepped over the mark and Franklin has no trouble popping it through from the square. There’s only ten points in at three quarter time. Unpleasant memories surface of the Swans’ comeback win at the MCG last year. When Franklin boots his fourth in the first minute of the final term the difference is only four points. But the Tigers are made of formidable material these days. Riewoldt is ably assisted by Vlaustin, Lambert, Short, Edwards, Nankervis and the rest of the crew. They maintain their fanatical pressure, run harder and spread wider than their counterparts. They keep attacking and kick the last three goals of the match. The Swans fade. Lambert sends a grubber in the direction of goals and it suddenly takes a bounce over two players in the square before lobbing safely over the line. Edwards snaps truly two minutes later. Lambert kicks the sealer at the 25-minute mark and the Tigers reinforce their position at the top of the table. It’s a good time to be a Richmond barracker. As the Tigerland theme reverberates around the stadium Pratt and Titus affirm they would have kicked 200 goals each in every season if they had played in perfect conditions under a retractable roof. Dyer wonders aloud how he would have managed to control three field umpires. Nash confirms that he would have been great in any era. They agree to meet again in September should the Tigers and the Swans meet in the Grand Final like they did back in ’34. Enjoyed your footy replay with links to the past. Also love the observation you make of the supporter in her crocheted fan gear, so spot on… Love theses links with the past that people still have.. ie making there own merchandise. The fog the night before this game was so heavy, where I am and was wondering how that would play out on Thursday with the roof.. Etihad was warm down on the fence surrounded by lots, but what a cold blast it was that hit once up on the concourse!! The night called for mulled wine in a thermos. Enjoy reading your match reports. Thanks John, I enjoy the nostalgia and links to past. I think in future they will look back and note that Jack Riewoldt played one of his greatest games.